This course is classroom based looking at the skills required to safely plan trips along the UK’s coastline. It will enable you to plan and navigate effectively on coastal journeys, interpreting information including maps, charts, coastal pilots and tide tables as well as weather and shipping forecasts. This course is a pre-requisite for the BCU 4 star Sea Leader Award, as well as being a course suitable for any sea kayaker wanting tidal planning training. Training will be classroom based. The emphasis of this course is an introduction to tides, how to predict them and how they work. In addition to this it will give you the skills to plan coastal journeys in areas that are affected by tidal movement. This planning will include the use of Tidal Streams Atlas’s, Pilots, Charts and Ordnance Survey Maps. 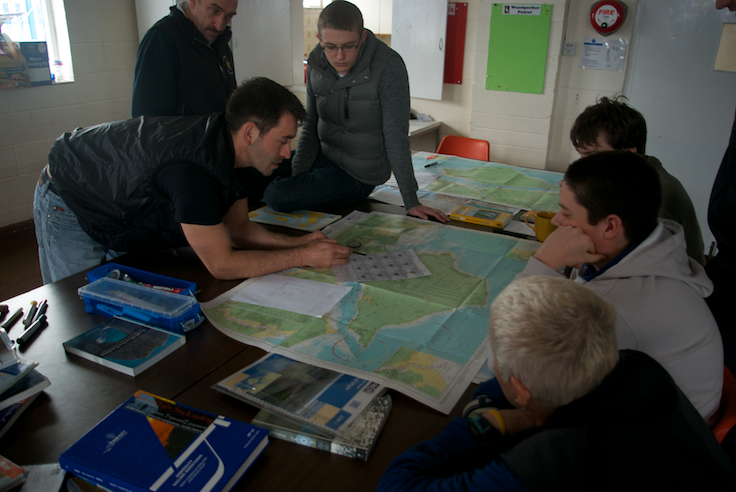 Having learned how to plan these coastal journeys we will also look at key navigation techniques to ensure that you can stay on route during your journey! The course is a practical classroom based day and no paddling equipment is required. Feel free to bring any of your own tidal planning resources. This is an indoor based course so no specialist equipment is needed. Please feel free to bring along any personal tidal planning resources with you. Drinks will be provided, and those who have come from work may use kitchen to heat up food before course if they wish. Venue: Wallasey District Scout Centre, 108 Broadway Avenue, Wallasey, Wirral. CH45 4SF. Please park in HQ grounds.